CHESTERFIELD – Chesterfield County Public Schools recently purchased a license to use Soundtrap, an online music and podcast recording studio, which will be rolled out to its 60,000 students. Initially, 33,000 middle and high school students will access the program as part of an innovative push to promote creativity and engagement, with the remaining students receiving the application later in the year. 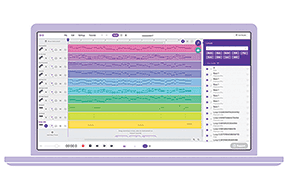 Having won numerous awards of excellence from educators around the world since its 2016 introduction, Soundtrap has now begun transitioning from a favorite learning tool deployed by individual teachers to a school-wide software program becoming part of the core curriculum. Soundtrap is the first solution for kids that lets them make music or audio recordings online with fellow students within their invited and secured group, record a tune or podcast, then share the music with classmates in the cloud from a multitude of devices and operating systems. As part of the progressive approach to education in the Chesterfield County schools, students have Chromebooks and carefully-chosen software to run on them, including creativity-promoting applications. Soundtrap is being rolled out to students on their Chromebooks this year. During an earlier “test drive” with a small group of students, Soundtrap demonstrated overwhelming, immediate engagement according to Brian Jones, executive director of technology services in the district. “Anytime you can introduce something to the classroom that’s both educational and that the students want to do on their own time, you’ve got a winner,” he said. This is made easy by the fact that Soundtrap works across operating systems and devices, from computers and tablets to phones. Soundtrap is the first cloud-based audio recording platform to work across all operating systems, enabling users to co-create music anywhere in the world. Soundtrap, which was acquired by Spotify in December, provides an easy-to-use music and audio creation platform for all levels of musical interest and abilities and is being used by the K-12 through higher-education markets. For more information, visit www.soundtrap.com.